Clock Limitations M2p.653x M2p.656x max internal clock (non-synchronized cards) 40 MS/s 125 MS/s min internal clock (non-synchronized cards) 1 kS/s 1 kS/s max internal clock (cards synchronized via star-hub) 40 MS/s 125 MS/s min internal clock (cards synchronized via star-hub) 128 kS/s 128 kS/s max direct external clock 40 MS/s 125 MS/s min direct external clock DC DC Bandwidth and Slewrate Filter Output Amplitude M2p.653x M2p.656x -3 dB analog bandwidth Filter 0 ± 3000 mV > 60 MHz > 60 MHz -3 dB analog bandwidth Filter 1 ± 3000 mV > 30 MHz > 30 MHz -3 dB analog bandwidth Filter 2 ± 3000 mV > 5 MHz > 5 MHz -3 dB analog bandwidth Filter 3 ± 3000 mV > 1 MHz > 1 MHz Slewrate Filter 0 TBD TBD V/ns TBD V/ns Dynamic Parameters M2p.653x Test - Samplerate 40 MS/s 40 MS/s 40 MS/s Output Frequency TBD MHz 4 MHz 800 kHz Output Level in 50 Ω ±900mV ±3000mV ±900mV ±3000mV ±900mV ±3000mV Used Filter 30 MHz 5 MHz 1 MHz NSD (typ) -TBD dBm/Hz -TBD dBm/Hz -TBD dBm/Hz -TBD dBm/Hz -TBD dBm/Hz -TBD dBm/Hz SNR (typ) TBD dB TBD dB TBD dB TBD dB TBD dB TBD dB THD (typ) -TBD dB -TBD dB -TBD dB -TBD dB -TBD dB -TBD dB SINAD (typ) TBD dB TBD dB TBD dB TBD dB TBD dB TBD dB SFDR (typ), excl harm. TBD dB TBD dB TBD dB TBD dB TBD dB TBD dB ENOB (SINAD) TBD TBD TBD TBD TBD TBD ENOB (SNR) TBD TBD TBD TBD TBD TBD M2p.656x Test - Samplerate 125 MS/s 125 MS/s 125 MS/s Output Frequency 24 MHz 4 MHz 800 kHz Output Level in 50 Ω ±900mV ±3000mV ±900mV ±3000mV ±900mV ±3000mV Used Filter 30 MHz 5 MHz 1 MHz NSD (typ) -TBD dBm/Hz -TBD dBm/Hz -TBD dBm/Hz -TBD dBm/Hz -TBD dBm/Hz -TBD dBm/Hz SNR (typ) TBD dB TBD dB TBD dB TBD dB TBD dB TBD dB THD (typ) -TBD dB -TBD dB -TBD dB -TBD dB -TBD dB -TBD dB SINAD (typ) TBD dB TBD dB TBD dB TBD dB TBD dB TBD dB SFDR (typ), excl harm. TBD dB TBD dB TBD dB TBD dB TBD dB TBD dB ENOB (SINAD) TBD TBD TBD TBD TBD TBD ENOB (SNR) TBD TBD TBD TBD TBD TBD THD and SFDR are measured at the given output level and 50 Ohm termination with a high resolution M3i.4860/M4i.4450-x8 data acquisition card and are calculated from the spec- trum. Noise Spectral Density is measured with built-in calculation from an HP E4401B Spectrum Analyzer. All available D/A channels are activated for the tests. SNR and SFDR figures may differ depending on the quality of the used PC. NSD = Noise Spectral Density, THD = Total Harmonic Distortion, SFDR = Spurious Free Dynamic Range. SFDR and THD versus signal frequency TBD TBD • Measurements done with a spectrum analyzer bandwidth of TBD MHz. • Please note that the output bandwidth limit also affects the THD as harmonics higher than the bandwidth are filtered. Order Information The card is delivered with 512 MSample on-board memory and supports standard replay, FIFO replay (streaming), Multiple Replay, Gated Replay, Continuous Replay (Loop), Single-Restart as well as Sequence. Operating system drivers for Windows/Linux 32 bit and 64 bit, ex- amples for C/C++, LabVIEW (Windows), MATLAB (Windows and Linux), LabWindows/CVI, IVI, .NET, Delphi, Java, Python and a Base license of the measurement software SBench 6 are included. Adapter cables are not included. Please order separately! PCI Express x4 Order no. D/A Resolution Standard mem Single-Ended Outputs M2p.6530-x4 16 Bit 512 MSample 1 channel 40 MS/s M2p.6531-x4 16 Bit 512 MSample 2 channels 40 MS/s M2p.6536-x4 16 Bit 512 MSample 4 channels 40 MS/s M2p.6560-x4 16 Bit 512 MSample 1 channel 125 MS/s M2p.6561-x4 16 Bit 512 MSample 2 channels 125 MS/s M2p.6566-x4 16 Bit 512 MSample 4 channels 125 MS/s Options Order no. Option M2p.xxxx-SH6ex (1) Synchronization Star-Hub for up to 6 cards incl. cables, only one slot width, card length 245 mm M2p.xxxx-SH6tm (1) Synchronization Star-Hub for up to 6 cards incl. cables, two slots width, standard card length M2p.xxxx-SH16ex (1) Synchronization Star-Hub for up to 16 cards incl. cables, only one slot width, card length 245 mm M2p.xxxx-SH16tm (1) Synchronization Star-Hub for up to 16 cards incl. cables, two slots width, standard card length M2p-upgrade Upgrade for M2p.xxxx: Later installation of option Star-Hub Services Order no. Recal Recalibration at Spectrum incl. calibration protocol Cables Order no. for Connections Length to BNC male to BNC female to SMA male to SMA female to SMB female Analog/Clock-In/Trig-In 80 cm Cab-3f-9m-80 Cab-3f-9f-80 Cab-3f-3mA-80 Cab-3f-3fA-80 Cab-3f-3f-80 Analog/Clock-In/Trig-In 200 cm Cab-3f-9m-200 Cab-3f-9f-200 Cab-3f-3mA-200 Cab-3f-3fA-200 Cab-3f-3f-200 Probes (short) 5 cm Cab-3f-9f-5 Clk-Out/Trig-Out/Extra 80 cm Cab-1m-9m-80 Cab-1m-9f-80 Cab-1m-3mA-80 Cab-1m-3fA-80 Cab-1m-3f-80 Clk-Out/Trig-Out/Extra 200 cm Cab-1m-9m-200 Cab-1m-9f200 Cab-1m-3mA-200 Cab-1m-3fA-200 Cab-1m-3f-200 Information The standard adapter cables are based on RG174 cables and have a nominal attenuation of 0.3 dB/m at 100 MHz. Software SBench6 Order no. SBench6 Base version included in delivery. Supports standard mode for one card. SBench6-Pro Professional version for one card: FIFO mode, export/import, calculation functions SBench6-Multi Option multiple cards: Needs SBench6-Pro. Handles multiple synchronized cards in one system. Volume Licenses Please ask Spectrum for details. Software Options Order no. SPc-RServer Remote Server Software Package - LAN remote access for M2i/M3i/M4i/M4x/M2p cards SPc-SCAPP Spectrum’s CUDA Access for Parallel Processing - SDK for direct data transfer between Spectrum card and CUDA GPU. Includes RDMA activation and examples. Signed NDA needed for access. (1) : Just one of the options can be installed on a card at a time. (2) : Third party product with warranty differing from our export conditions. No volume rebate possible. Technical changes and printing errors possible SBench, digitizerNETBOX and generatorNETBOX are registered trademarks of Spectrum Instrumentation GmbH. Microsoft, Visual C++, Windows, Windows 98, Windows NT, Window 2000, Windows XP, Windows Vista, Windows 7, Windows 8 and Windows 10 are trademarks/registered trademarks of Microsoft Corporation. LabVIEW, DASYLab, Diadem and LabWindows/CVI are trademarks/registered trademarks of National Instruments Corporation. MATLAB is a trademark/registered trademark of The Mathworks, Inc. Delphi and C++Builder are trademarks/registered trademarks of Embarcadero Technologies, Inc. Keysight VEE, VEE Pro and VEE OneLab are trademarks/registered trademarks of Keysight Technologies, Inc. FlexPro is a registered trademark of Weisang GmbH & Co. KG. PCIe, PCI Express and PCI-X and PCI-SIG are trademarks of PCI-SIG. LXI is a registered trademark of the LXI Consortium. 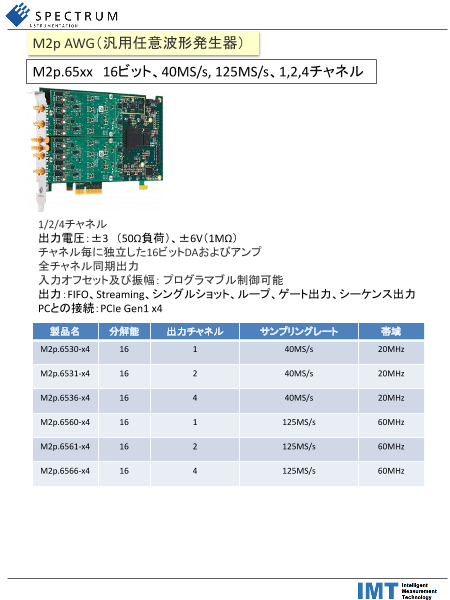 PICMG and CompactPCI are trademarks of the PCI Industrial Computation Manufacturers Group. Oracle and Java are registered trademarks of Oracle and/or its affiliates. Intel and Intel Core i3, Core i5, Core i7, Core i9 and Xeon are trademarks and/or registered trademarks of Intel Corporation. AMD, Opteron, Sempron, Phenom, FX, Ryzen and EPYC are trademarks and/or registered trademarks of Advanced Micro Devices. NVIDIA, CUDA, GeForce, Quadro and Tesla are trademarks/registered trademarks of NVIDIA Corporation.